Squad depth has been a problem for Liverpool in the past, but is it now a strength? Here's why the Premier League leaders look well-equipped to cope with a potentially gruelling second half of the season. 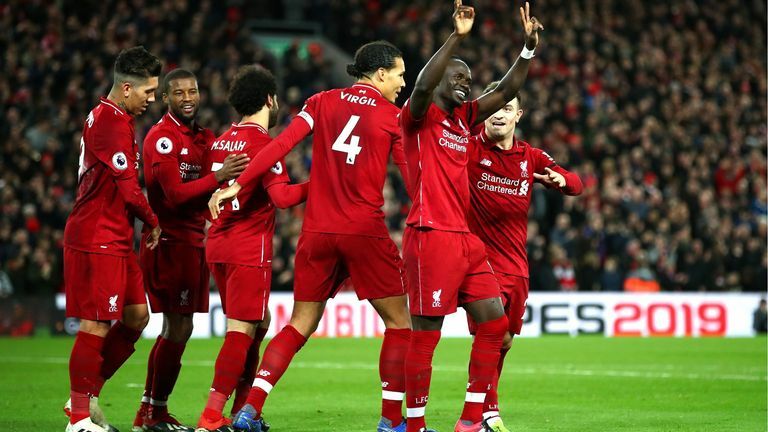 Liverpool's extraordinary season continued with Saturday's 5-1 thrashing of Arsenal. After 20 games, they have amassed more points than in any previous top-flight campaign. It is only the third time they have reached this stage of a season unbeaten. They are on course to register the best defensive record and highest points total in Premier League history. Pep Guardiola, whose Manchester City side welcome Liverpool to the Etihad Stadium on Thursday, has conceded that Liverpool might be the "best team in the world right now", but their success this season is not just down to 11 players. One of the biggest differences is that Jurgen Klopp finally has a squad he can fall back on. The effects can be seen all over the pitch. Liverpool's defensive record, for example, becomes even more impressive when you consider the circumstances. Klopp was unable to call on either Dejan Lovren or Joel Matip at the start of the season, but Joe Gomez excelled in their absence. The youngster was then injured, suffering a fractured leg at the start of December, but Matip and Lovren stepped back in impressively, ensuring Liverpool have been unaffected by his absence. Further forward, Liverpool's summer signings have added versatility and variety. Fabinho and Naby Keita have only started 16 Premier League games between them so far, with Klopp careful to bed them in slowly, but they have still made important contributions. Their limited game-time also means they will be fresh for the months ahead. Fabinho and Keita are helping Liverpool cope without Alex Oxlade-Chamberlain and their arrivals have impacted others positively, too. The increased competition for places has brought the best out of James Milner, who has moved back into the central midfield, while Georginio Wijnaldum and Jordan Henderson were both praised by Klopp on Saturday. See Man City and Liverpool go head to head on Sky Sports Premier League. At just £13m, Xherdan Shaqiri has proved the shrewdest of the new additions. The Switzerland international's arrival from relegated Stoke was not greeted with much fanfare, but he has adapted swiftly, scoring six goals in 15 Premier League appearances and allowing Klopp to adapt Liverpool's attacking approach and avoid the pitfall of becoming predictable. What do PL clubs need in January? Shaqiri's creativity has helped Liverpool unpick deep-lying defences - only Mohamed Salah has created more chances per 90 minutes so far this season - and his versatility has allowed him to slot in everywhere from central midfield to wide on the right - giving Klopp scope to rotate at the same time as easing the goalscoring burden on Salah, Mane and Firmino. Even peripheral squad members have made decisive contributions. Daniel Sturridge has fallen in line following his return from loan at West Brom at the end of last season, earning praise from Klopp and scoring two Premier League goals in just 260 minutes of action. In September, it was his stunning late strike that salvaged a 1-1 draw at Chelsea, preserving Liverpool's unbeaten start and keeping them level on points with City. Divock Origi has made a vital difference, too, emerging from the bench at the start of December to score a late winner in the Merseyside derby on his first appearance of the season. Had Liverpool drawn that game, they would have slipped four points behind City. Instead, Origi's goal sparked an eight-game winning streak which has transformed the title race. Klopp deserves credit for keeping players such as Sturridge and Origi motivated - he has also successfully brought Nathaniel Clyne in from the cold recently - and it can now be said that the depth and completeness of Liverpool's squad compares favourably with either of the sides directly below them in the table. Manchester City, for their part, remain worryingly dependent on Fernandinho. The 33-year-old, the only natural holding midfielder in Guardiola's squad, frequently finds his hands full in front of City's defence and when he doesn't play - as in the recent defeats to Crystal Palace and Leicester - his importance is even more obvious. City's creative quality is such that they have been able cope admirably without Kevin De Bruyne, but they have another glaring weakness at left-back. There is no one in the squad capable of fulfilling the role performed by the injured Benjamin Mendy. Oleksandr Zinchenko was praised for his performance there against Southampton, but he is a different kind of player to the Frenchman and Guardiola knows it. It is hardly surprising that Tottenham, the only team in England's top-four divisions not to sign a single player in the summer transfer window, have issues with squad depth, too. In fact, given the lack of investment, it is remarkable that they are even in contention at all. Mauricio Pochettino has already had to cope without key players Hugo Lloris, Dele Alli, Jan Vertonghen, Christian Eriksen and Eric Dier at one point or another - not to mention long-term absentees Mousa Dembele and Victor Wanyama - so it is understandable that, after a run of nine games in 27 days, the strain began to show in their capitulation against Wolves. What do PL teams need in January? When Spurs were chasing that game, it was also noticeable that, with the unfavoured Georges-Kevin N'Koudou the only remaining attacking option on the Tottenham bench after Lucas Moura had replaced Alli, Pochettino did not make any further substitutions. Soon, he will also have to manage without the Asia Cup-bound Heung-Min Son. It all stacks up in Liverpool's favour. Their nine-point lead at the top of the table was cut to seven by Manchester City's 3-1 win over Southampton on Sunday, but regardless of what happens at the Etihad Stadium on Thursday, they can approach the final months of the season knowing they have the squad depth to go the distance.